The New York Times has officially announced that it will roll out its montly digital subscription plan for U.S. users on March 28. Under the plan, those defined as “heavy consumers” — users who access more than 20 nytimes.com articles per month — will be required to enroll in one of three subscription plans in order to access content. The plans will also cover those who access the site through mobile apps. “As the market for and delivery of digital content evolves, we believe that supplementing advertising revenue with digital subscription revenue makes tremendous sense,” Janet L. Robinson, president and CEO of the New York Times company, said in a press release. Users who want full access to the site plus access through a mobile device will have to pay $15 monthly subscription fee. If you’re an iPad owner, you’ll be required to pay $20 monthly for site and iPad app access. For $35 you’ll get the access to everything: website, smartphone and iPad app. Subscribers of either the Times or International Herald Tribune print editions will get free, unlimited access to the site. The front page of nytimes.com will remain free to all users without a subscription. 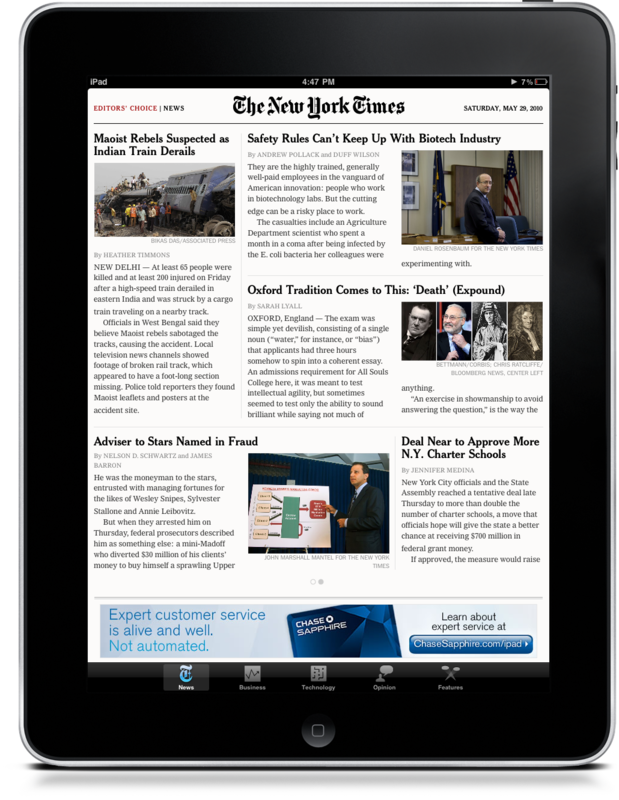 The “Top News” portion of the Times’ tablet and mobile apps will remain free to access sans subscription. Users who have exceeded the 20-articles-per-month limit will still be able to read up to five additional articles per day via Google searches. Articles will always be accessible — without cutting into that limit — when linked to from social networks and blogs. The subscription plan goes into effect starting today for Canadian users and for the U.S. and users in other countries on March 28.